October 15 2015. 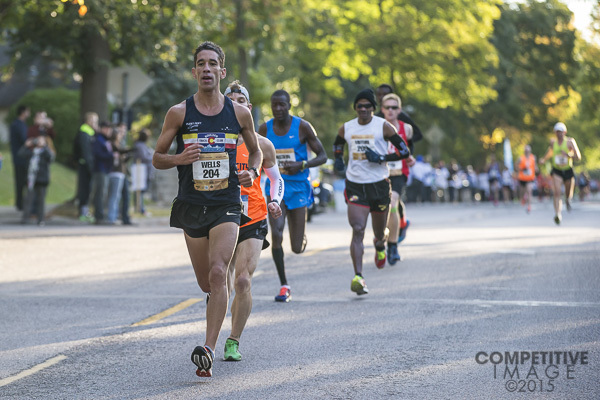 On a beautiful day in early October, Masters runners contended for Marathon supremacy at the top of the Great Lakes area at the Twin Cities Marathon (TCM) in Minnesota which runs from Minneapolis to St Paul. This was the 25th year for the USATF Masters Marathon Championship to be part of the TCM. Women. There appeared to be 5 contenders for the overall Masters win. Sheri Piers (Falmouth ME) was back to defend her title; her time last year a sparkling 2:42:46! Her running partner, Kristin Barry (Scarborough ME), 3rd in 2:52:19, also returned to challenge for a medal. New challengers included Jennifer Schulze (Clive IA) who ran a 2:47 at Grandma's Marathon last year, Megan Skeels (Aledo TX), who ran a 1:17:12 20K race earlier thisi year and has a 2:42:40 to her credit from the 2012 Olympic Trials, and Molly Friel (Fresno CA), who ran a 2:41:30 and a 2:44:59 in two different west coast marathons in 2014. Unfortunately Skeels was unable to compete in the event. The first 5K went about as expected as Piers took the lead in 18:55, with Schulze 11 seconds back and Barry and Friel about a half minute behind Schulze. At that point Piers was only 8 seconds off her 2014 winning pace, nothing to be concerned about. Any fans from Maine would have been quite happy at that point with Piers leading the way and Barry running a half minute faster than her 2014 pace, in 3rd. The race continued without surprises through the 10K mark, at least as far as position was concerned,with the order the same as at the 5K, except that Friel was now up on Barry's shoulder challenging for 3rd place. By the halfway mark there was a hint of an upset in the making although too early to tell. Schulze crossed the mat with Piers on her shoulder 1 second back in 1:20:13 and 14. And now Friel was firmly in 2nd with almost a minute lead over Barry. But then the wheels came off for Piers and it was clear this would not be her day. Something was not right and the Marathon is unforgiving. In 2014, Piers covered the distance from 13.1 to 30K in 34:28; this time it took her 39:01. So at the 30K mark it was Schulze in the lead at 1:55:29 with Friel 2 and a half minutes behind her. Piers was 3 and a half minutes back and fading, and Barry a little over 4 minutes back. By the 21 mile mark, Barry too had passed Piers and that was the only remaining change to the finish. In the end, Schulze had an unexpected but well deserved win in 2:45:17. Friel, the elder stateswoman of the group at 48 years of age, pulled in 2nd in 2:47:48, with Barry taking her 2nd consecutive bronze medal in 2:50:17, two minutes faster than her 2014 time! Piers ran a gutsy last 5 miles to finish 4th overall in 2:52:23, nearly ten minutes slower than her time last year. We can be sure Piers will be back next year and looking to be down close to 2:40 again. If Schulze wants to defend her title she will definitely want to be at the top of her game next year. Medalists: Schulze 2:45:17; Friel 2:47:48; Barry 2:50:17. Men. Mbarak Hussein (Albuquerque NM) was back to defend his title. Now that he had turned 50 would there be a chink in his armor? There were four primary challengers who were hoping it was so. Josh Metcalf (Glencoe MN) was a local favorite. Stephen Muturi (Rochester MI), Michael Wardian (Arlington VA) and Clint Wells (Boulder CO). Metcalf ran a 2:28:23 at Grandma's Marathon in June and had an early September tune-up Half Marathon in 1:09:20. Muturi had run a 2:26:02 in the Chicago Marathon two years earlier as a 38 year old. This would be his first Marathon as a Masters runner. Wardian was the runner-up last year, finishing 18 seconds behind Hussein. After the race,last year, Wardian indicated that he had been closing on Hussein but ran out of race course. Would things prove differently this year? Wells seemed a bit of a wild card; he had run a 2:23:11 at the TC Marathon in 2012 but had not run a fast marathon like that since. He did have two very fast half marathon races, in 1:07:57 at the NYC Half Marathon in March 2014 and a 1:07:09 at the 2015 USATF Half Marathon Masters Championships at the Rock N Roll San Diego Half Marathon at the end of May. But would he have the staying power? Hussein, Metcalf, Muturi and Wells formed a lead pack early, going through the 5K mark in 17:06. Wardian was already well off the pace and, unless he had a terrific surge to unleash later in the race, may have been in trouble already, 40 seconds back. The big news between 5K and 10K was that a Wells surge had opened up a 14 second lead over the chase pack of Hussein, Metcalf and Muturi. Wardian went through in 35:23, nearly a minute and a half behind the chase pack and it was clear this would not be his day. Had he run too many marathons in the first half of the year? Few would advise running 6 in the first 4 months of the year. But then he ran a 7th at the end of May in under 2:30. So who is to say? Wells hit the half marathon mark in a smoking 1:10:29! That was too much for the chase pack which came through 47 seconds later. Did Wells go out too fast? Would he pay the price in the later stages of the race? In any case by the time they hit the 30K (about 18.6 miles) mark, Wells had padded his lead slightly to a full minute. And the chase pack was breaking up a bit as Metcalf left the other two 6 seconds further back. By 21 miles in, Wells was leading by 1:03 but now Hussein was leaving Muturi and closing to within 5 seconds of Metcalf. By the 24 mile mark, Hussein was on Metcalf's shoulder as they came through still a minute behind Wells. Muturi had been dropped and was now a full minute behind these 2 chasers. But was there enough time? Wells did slow over the final 2 miles 385 yards. In fact Hussein remarkably cut 53 seconds of Wells's 1:01 lead away but it was not enough. The race course ended and Wells was across the line in 2:24:00 for the gold, with Hussein 8 seconds back with a hard-earned silver. Metcalf closed off the podium with a 2:24:22. It was quite a race, with only 22 seconds between 1st, 2nd and 3rd! Even though Hussein was unable to defend his crown, he had the satisfaction of running the fastest Marathon by an American runner 50 years older and up. He broke the record established by the legendary Norm Green, of 2:29:11 set in May of 1984. Not only did Hussein break a record that had stood for over 30 years, he smashed it by over 5 minutes, an amazing feat! Ratification by USATF is in order but as Hussein already has the record for 40-44 and 45-49 year olds set on this course, it will, I hope, be just a formality. Wells 2:24:00; Hussein 2:24:08; Metcalf 2:24:22. 40-44. Schulze, Barry and Piers, discussed above in the overall race took 1-2-3 in this category. Schulze 2:45:17, Barry 2:50:17, Piers 2:52:23. 45-49. Friel, who finished 2nd overall, took this group by over 6 minutes. But the two contenders for 2nd had more of a battle. Katherine Wolski (Knoxville TN) took it out hard from the gun, crossing the 5K mark in 20:33, with Amy Halseth (Indianapolis IN) 4 seconds back. But Halseth was able to duplicate that pace in the second 5K, hitting the 10K in 41:13 with Wolski now 20 seconds back. From there out Halseth steadily built a lead to take the silver n 2:54:05 to Wolski's broze medal time of 2:57:12. Friel 2:47:48; Halseth 2:54:05; Wolski 2:57:12. 50-54. The first two places int his group were pretty clear cut. Local favorite Wanda Gau (Little Falls MN) took the gold by over 12 minutes in 3:08:19, and Clarice Esslinger (Mankato MN) took the silver by over 6 minutes. Patricia Fasola came all the way from Mission Viejo CA to compete for a medal and did not go home empty handed as she finished 3:26:51 after the gun went off, in 3rd place. Gau 3:08:19; Esslinger 3:20:25; Fasola 3:25:51. 55-59. Donella Neuhaus (Minneapolis MN) ran her fastest TC Marathon since 2011 but Margaret Sheridan (Woodbury MN) was not able to duplicate her times of the last few years. As a result the gold went to Neuhaus in 3:27:42. Sheridan took the silver 7 minutes back and about 18 minutes slower than last year. Clearly not the best of days for Sheridan but I trust she will be back to her former fitness by next year. Doris Windsand-Dausman traveled up from Oak Ridge TN to claim the bronze medal in 3:39:40. Neuhaus 3:27:42; Sheridan 3:34:51; Windsand-Dausman 3:39:40. 60-64. Andriette Wickstrom (Storm Lake IA), a terrific Masters runner, ran a fine marathon in 2014 only to finish way behind Christine Kennedy, who has set Masters age group records at a number of distances. This year she graduated to the 60-64 age group and Kennedy had pinpointed Chicago for a record try instead of the TC Marathon. In any case Wickstrom took the gold by over a half hour, running 3:22:49. Karen Manske (Stillwater MN) finished 2nd by a wide margin as well, with Debra Spence (Golden CO) in 3rd. Wickstrom 3:22:49; Manske 3:54:20; Spence 4:25:20. 65-69. The contest in this group was actually tighter than that in the next younger division. Carol Brouillard (Spring Lake Pa MN) ran the first 5K and the last 2 miles, 385 yards faster than Delma Bartelme (St Cloud MN) but in between Bartelme turned on the jets. The result was a 7 minute victory for Bartelme over Brouillard who, in turn, had a 13 minute margin on the bronze medalist, Mary Croft (Tucson AZ). Bartelme 4:10:58; Brouillard 4:18:23; Croft 4:31:31. 70-74. Irene Terronez (Rio Ranch NM) had this age group all to herself. With no need to hurry and a big reward for finishing the race, Terronez took the gold in 6:04:31. 40-44. As the summary of the overall race details, this group finished up: Wells 2:24:00; Metcalf 2:24:22; Muturi 2:26:37. 45-49. This year no one for this group was in the hunt for an overall medal. Tony Torres (Cedarglen CA) took it out fast, crossing the 5K mark in 17:31, a minute and a half ahead of his closest rival, Daniel Strike (Roseville MN). The 3rd major contender, Jim Koneazny (Pasadena CA) was a half minute further back. By the halfway point, Torres had more than 6 minutes on his two rivals and Strike was still almost a half minute ahead of Koneazny. But the next few miles were telling for 2nd and 3rd as Koneazny was running a negative split. By the 21 mile mark Koneazny was over a minute ahead of Strike and cruised in, taking the silver medal by 3 minutes over Strike. Torres 2:34:27; Koneazny 2:40:05; Strike 2:43:01. 50-54. Hussein took this category by 12 minutes. Ken Pliska (Golden CO) and Bob Weiner (Evergreen CO) battled it out for medal honors. The race would have been even more interesting had two of the co-favorites for silver shown up, Spyros Barres (Mystic CT) and Ricardo Maldonado (Scottsdale AZ). As they did not, Pliska and Weiner went at it. Pliska took it out in 18:28 with Weiner hanging close 3 seconds back. Byt the 10K mark the margin was still only 4 seconds. But Pliska kept up the pressure and by the half marathon had a 23 second margin over Weiner, hitting it in 1:16:37. Pliska gradually built the lead to a little over two minutes. So even though Weiner closed fast enough to cut 18 seconds off of Pliska's lead, it was not enough. Hussein 2:24:08; Pliska 2:36:01; Weiner 2:38:10. 55-59. Tom Dever (Terre Haute IN), the terrific Masters runner topped off an excellent year with a dominating performance at Twin Cities, winning the age group by nearly 15 minutes. Earlier in the year he ran a 1:18:55 at the Indy Mini Marathon and then a few weeks later, finished 2nd to the indomitable Brian Pilcher at the USATF Half Marathon championships as part of the Rock N Roll San Diego Half Marathon in 1:17:12. On this day he crossed the half marathon mat in 1:20:35 and finished in 2:49:46. Local favorite, Dennis Wallach (Chanhassen MN) finished 15 minutes back, edging Thomas Prentice (Winter Haven FL) by a mere 15 seconds. Prentice passed the halfway mark in 1:28:53 with a 2:20 lead over Wallach but Wallach stayed on pace but didn't close to within 2 minutes until the 24 mile mark. But from that point on Wallach closed in, passed, and took the silver medal. Dever 2:49:46; Wallach 3:04:36; Prentice 3:04:51. 60-64. Thomas Gaudette (Palos Hills IL) took this division in 3:26:58, followed by Denny Jordan (Roseville MN) a bit over 4 minutes back and Jerry Heaps (Apple Valley MN) nailing 3rd 25 minutes later. Gaudette 3:26:58; Jordan 3:31:16; Heaps 3:56:26. 65-69. Leroy Jordan (Backus MN) ran a strong 3:24:01 to take this group. Mick Justin (Misswa MN) was 25 minutes back in second, followed across the line 3 and a half minutes later by John Naslund (Bloomington MN) in 3rd. Jordan 3:24:01; Justin 3:45:05; Naslund 3:48:37. 70-74. Les Martisko (North Mankato MN) had this division all to himself, finishing the race in 5:25:03 to take gold. 75-79. Surprisingly there was much more competition in this age group but John Ouweleen (Sebastien FL) knows how to handle competition. He ran 3:23:42 to take this division by nearly 29 minutes over his chief rival, Joseph Burgasser (St. Petersburg FL). Forty-one minutes after Burgasser claimed the silver medal, Ed Rousseau (Minneapolis MN) took 3rd. Ouweleen 3:23:42; Burgasser 3:52:14; Rousseau 4:33:13. 80 and up. Bill Dodson (Mountain View CA) had this group to himself and became the oldest gold medalist by stepping out smartly, keeping up a good pace, and finishing in 4:28:27. To compare performances across age groups, USATF utilizes Age-grading to level the playing field. Each athlete's performance is assigned an age-grade based upon how close the finishing time is to the world's best. If one matches the world's best, that is a 100% score; 90% is a world-class time and 80% is national class. There is no adjustment for difficulty of course so TC Marathon age-grades are likely to be a bit lower than other flatter, faster marathons. For both the women and the men, the 2nd place finisher had the highest age-grade score. The overall winners had the 3rd and 4th best age-grade score respectively. John Ouweleen at 75 is the oldest runner among the top age grades; Andriette Wickstrom has the honors on the women's side.